This article is about the year 1776. Year 1776 (MDCCLXXVI) was a leap year starting on Monday (link will display the full calendar) of the Gregorian calendar and a leap year starting on Friday of the 11-day slower Julian calendar. 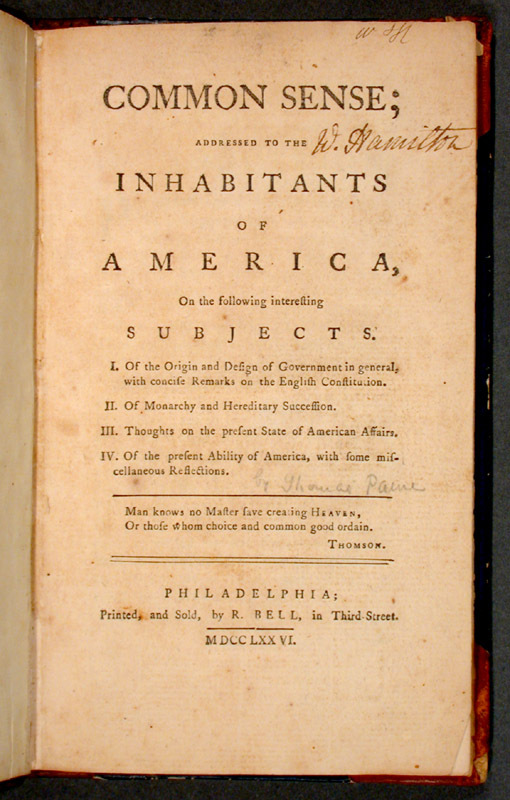 January 15 – Thomas Paine publishes Common Sense. January 20 – American Revolution: South Carolina Loyalists led by Robert Cunningham sign a petition from prison agreeing to all demands for peace by the formed state government of South Carolina. February 17 – Edward Gibbon publishes the first volume of The History of the Decline and Fall of the Roman Empire. February 27 – American Revolution: Battle of Moore's Creek Bridge: North Carolina Loyalists charge across Moore's Creek bridge near Wilmington to attack what they mistakenly believe to be a small force of rebels. Several loyalist leaders are killed in the ensuing battle. The patriot victory virtually ends all British authority in the town. March 4 – The American Revolution: The Americans capture "Dorchester Heights" dominating the port of Boston, Massachusetts. March 9 – Adam Smith publishes The Wealth of Nations. March 17 – American Revolution: Threatened by Patriot cannons on Dorchester Heights, the British evacuate Boston. March 28 – Juan Bautista de Anza finds the site for the Presidio of San Francisco. April 12 – American Revolution: The Royal Colony of North Carolina produces the Halifax Resolves making it the first British colony to officially authorize its Continental Congress delegates to vote for independence from the Kingdom of Great Britain. May 1 – Adam Weishaupt founds the Bavarian Illuminati (Order of the Illuminati) in Ingolstadt, Bavaria. May 4 – Rhode Island becomes the first American colony to renounce allegiance to King George III of Great Britain. June 7 – American Revolution: Richard Henry Lee of Virginia proposes to the Continental Congress that "these united colonies are, and of right ought to be, free and independent states." June 8 – American Revolution: Battle of Trois-Rivières: American invaders are driven back at Trois-Rivières, Quebec. June 11 – American Revolution: The Continental Congress appoints a committee to draft the Declaration of Independence. June 12 – American Revolution: Virginia Declaration of Rights by George Mason adopted by the Virginia Convention of Delegates. June 15 – American Revolution: Delaware Separation Day: The Delaware General Assembly votes to suspend government under the British Crown. June 17 – Lt. Jose Joaquin Moraga leads a band of colonists from Monterey Presidio, landing on June 29 and constructing the Mission Dolores of the new Presidio of San Francisco. July 2 – American Revolution: The final (despite minor revisions) U.S. Declaration of Independence is written. The Continental Congress passes the Lee Resolution. July 4 – American Revolution: United States Declaration of Independence. The United States of America officially declares independence from Great Britain. July 4: American Declaration of Independence. July 8 – American Revolution: The Liberty Bell rings for the first public reading of the Declaration of Independence. July 9 – American Revolution: An angry mob in New York City topples the equestrian statue of George III in Bowling Green. July 12 – Captain James Cook sets off from Plymouth England on his third, and fatal, expedition to the Pacific Ocean. August 15 – American Revolution: First Hessian troops land on Staten Island to join British forces. August 27 – American Revolution: Battle of Long Island: Washington's troops routed in Brooklyn by British under William Howe. September – First running of the St. Leger Stakes horse race in England. September 6 – Hurricane hits Guadeloupe, killing more than 6000. September 7 – American Revolution: World's first submarine attack. American submersible craft Turtle attempts to attach a time bomb to the hull of British Admiral Richard Howe's flagship HMS Eagle in New York Harbor. September 11 – American Revolution: abortive peace conference between British and Americans on Staten Island. September 15 – American Revolution: British land on Manhattan at Kip's Bay. September 22: British hang spy Nathan Hale in New York City. September 16 – American Revolution: Battle of Harlem Heights is fought. September 22 – American Revolution: Nathan Hale executed in New York City for espionage. October 7 – Crown Prince Paul of Russia marries Sophie Marie Dorothea of Württemberg. October 9 – Father Francisco Palou founds Mission San Francisco de Asis in what is now San Francisco, California. October 11 – American Revolution: Battle of Valcour Island: On Lake Champlain near Valcour Island, a British fleet led by Sir Guy Carleton defeats 15 American gunboats commanded by Brigadier General Benedict Arnold. Although nearly all of Arnold's ships are destroyed, the two day-long battle will give Patriot forces enough time to prepare defenses of New York City. October 28 – American Revolution: Battle of White Plains: British forces arrive at White Plains, attack and capture Chatterton Hill from the Americans. October 31 – In his first speech before British Parliament since the Declaration of Independence that summer, King George III acknowledges that all is not going well for Britain in the war with the United States. November 16 – American Revolution: Hessian mercenaries under Lieutenant General Wilhelm von Knyphausen capture Fort Washington from the American Continentals. The captain of the American navy ship USS Andrea Doria fired a salute to the Dutch flag on Fort Oranje and Johannes de Graaff decided to answer the salute with eleven gun shots. December 5 – The Phi Beta Kappa society is founded at the College of William and Mary. December 7 – American Revolution: Marquis de Lafayette attempts to enter the American military as a major general. December 21 – American Revolution: The Royal Colony of North Carolina reorganizes into the State of North Carolina after adopting its own constitution. Richard Caswell becomes the first governor of the newly formed state. December 23 – American Revolution: Thomas Paine, living with Washington's troops, begins publishing The American Crisis, containing the stirring phrase, "These are the times that try men's souls." December 25 – American Revolution: Gen. George Washington orders the first issue of The Crisis read to his troops on Christmas Eve, then at 6 p.m. all 2600 of them march to McKonkey's Ferry, cross the Delaware River and land on the Jersey bank at 3 a.m.
December 26 – American Revolution: Battle of Trenton: Washington's troops surprise the 1500 Hessian troops under the command of Col. Johann Rall at 8 a.m. outside Trenton and score a victory, taking 948 prisoners while suffering only 5 wounded. ^ "Timeline of the American Revolutionary War". Independence Hall. Archived from the original on 30 May 2007. http://web.archive.org/web/20070530054927/http://ushistory.org/march/timeline.htm. Retrieved 2007-06-01. This page uses content from the English language Wikipedia. The original content was at 1776. The list of authors can be seen in the page history. As with this Familypedia wiki, the content of Wikipedia is available under the Creative Commons License. 66 people were married in 1776. There were 0 military battles in 1776.